How to Apply for Syndicate Bank SO Specialist Officers Recruitment 2019: Syndicate Bank has invited application for recruitment to Specialist Officer post in various verticals/ scales. Online registration portal will be open from March 29 and candidates can apply till April 18. A total of 129 vacancies have been notified by the Bank for Senior Manager (Risk Management), Manager (Risk Management), Manager (Law), Manager (IS Audit) and Security Officer. Selected candidates will be on a probation period of one year from the date of joining. Candidates must have required educational qualification and minimum years of experience as prescribed by the Bank. Candidates will be selected on the basis of online test and group discussion or interview. The online exam will comprise questions from reasoning, quantitative aptitude, English language, professional knowledge relevant to the post. The exam will carry a total of 200 marks and candidates will be allowed 2 hours and 30 minutes. The personal interview will assess the candidate's personality, level of communication, clarity & problem solving innovativeness, level of efficiency, willingness of work in any part of the country, suitability of the post. The minimum qualifying marks in the interview will be 50% for the general category and 45% for SC/ ST/ PwBD category. The exam will be held in June 2019. Exact date will be notified to candidates later. Candidates who will apply for the post need to pay Rs 100+ GST as applicable, if belonging to SC/ST/PwBD and Rs 600/- + GST if belonging to General & Others. 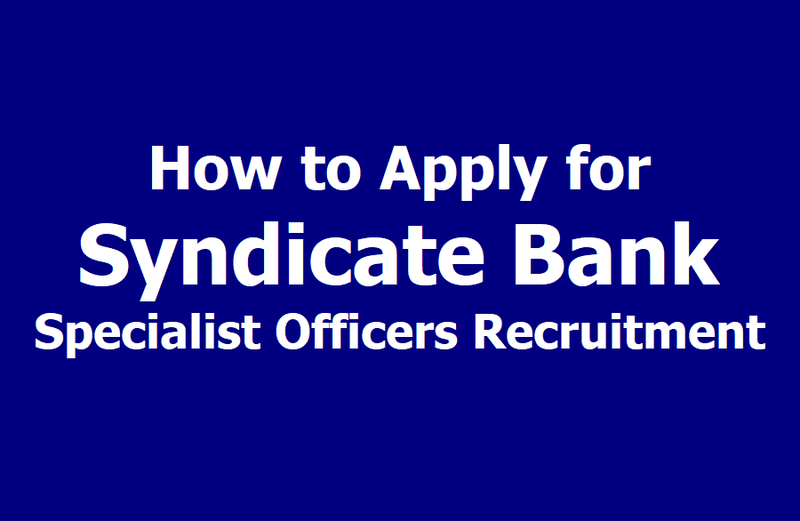 Step 1: Visit the official website of Syndicatebank at https://www.syndicatebank.in. Step 2: Click on the Career Page Link. Step 4: You will be redirected to the application portal where you will have to first register by providing your email id and phone number. Step 5: A provisional registration number and password will be sent to the registered email id and phone number. Use this to login to the application portal. Step 6: Fill in the required details in the fields provided and Complete the application form and make application fee payment. Step 7: After application completion, print a copy of the confirmation page for future reference.